Corpusty Mill, Norfolk demonstrates what happens when two brothers are let loose with their time and imagination. 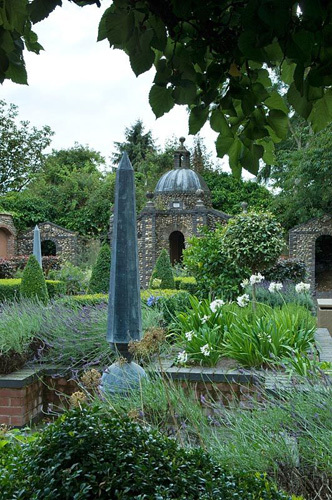 They have created, over a large area, three gardens which act as a setting for sculpture and follies. In a series of rooms, beginning with what Roger Last calls the ancient garden, there are grottoes, pavilions, flint walls with classical niches, a rather surprising mural of the owner, a blue painted wood henge, a tall stainless steel spire, highly structural ‘kitchen’ garden, a contemporary courtyard and so on and so on. A garden of great artistry. All this may blind one to the fact that it has strong horticultural credentials too. 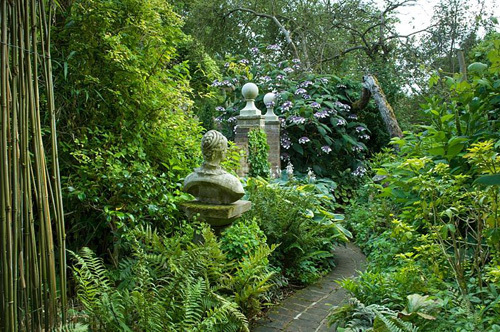 Roger Last likes flowering shrubs, but, without using formal borders, herbaceous plants are used as part of the art. The garden is open by appointment. This entry was posted in My favourite, Seasonal, Summer on August 3, 2017 by gapadmin.